Psychology of Well-Being is inviting submissions for a special issue of the journal that will be dedicated to the topic of Positive Computing. The decades between 1970 and 1990 saw the creation and blossoming of a partnership between many disciplines around what was called cognitive science. Artificial Intelligence was one of the outcomes; another was a set of new engineering practices that helped optimize technologies so they would be safer to use and would maximize productivity. Today we need a new partnership between psychologists, social scientists, designers and engineers so that future technologies have a wider design brief and take into account the impact they have on well-being. This is an area we call positive computing. 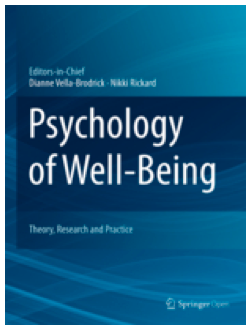 Psychology of Well-Being is a SpringerOpen journal which promotes a multidisciplinary approach to the study of well-being. The ultimate aim of the journal is to translate this scientific knowledge into practical and effective methods of enhancing well-being for individuals, groups and communities from a variety of contexts. This special issue of Psychology of Well-Being aims to contribute to this new partnership and bring together interdisciplinary perspectives and experiences from psychologists, social scientists, designers and software engineers working together towards improving well-being and human flourishing. • Quantified self, personal informatics, nudge, and behaviour change interventions where the desired outcome is improved psychological wellbeing. • Technology designs, such as activity trackers, wearable physiological sensors and computers (e.g. watches) where psychological well-being is taken into account or that can be used to assess it. • Changes to any software or web-based tool made in order to improve impact on user well-being. If you have a paper that fits one of the aforementioned descriptions, you are invited to submit a full length manuscript of no more than 7,500 words. Submitted papers should report new and original results that are unpublished elsewhere. Please prepare your manuscript with the template file and guidelines found at www.psywb.com/authors/instructions. Manuscripts should be sent through the online system at www.psywb.com/manuscript. Authors should choose “special issue on positive computing” as the Journal Section when submitting papers. All submitted manuscripts will undergo a full peer review process consistent with usual rigorous editorial criteria for Psychology of Well-Being. Note that the usual author publication fee will be waived as this is a special issue.